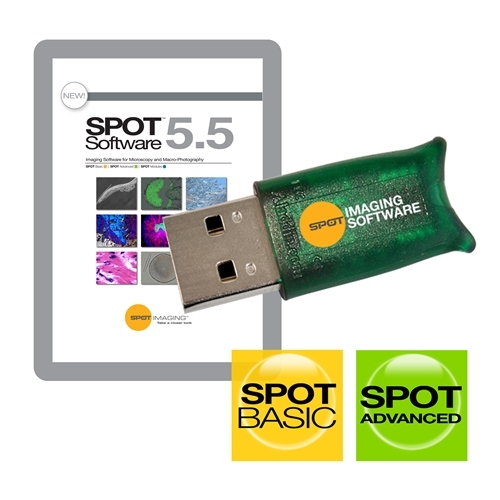 Modules for peripheral device control, quantitative imaging, extended depth of focus and live image overlay can be added to the SPOT 5.5 Advanced Software to support specialized functions if needed for your application. The modules can be purchased separately so they can be added as your needs evolve. 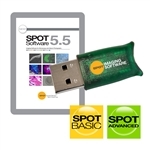 This is a new SPOT 5.5 Advanced Software license with a USB hardware key/dongle to run the software. An electronic download link to the installer is provided with this purchase. NOTE: if you do not have internet access and are unable to download the software electronically, physical media (USB thumb drive) is available for purchase from the options listed below. Supports SPOT camera models except PCI and PCIe card connected cameras, as well as FireWire connected cameras on Windows 10, due to updates by Microsoft.